Annother exotic, crop-damaging insect was discovered in North Carolina last month. The insect Drosophila suzukii was detected in insect traps at both ends of the state by extension specialist Dr. Hannah Burrack. The fly, a close relative of the “fruit flies” used in genetic research (Drosophila melanogaster), was first detected in the United States in 2008 among the fruit orchards and vineyards of California. 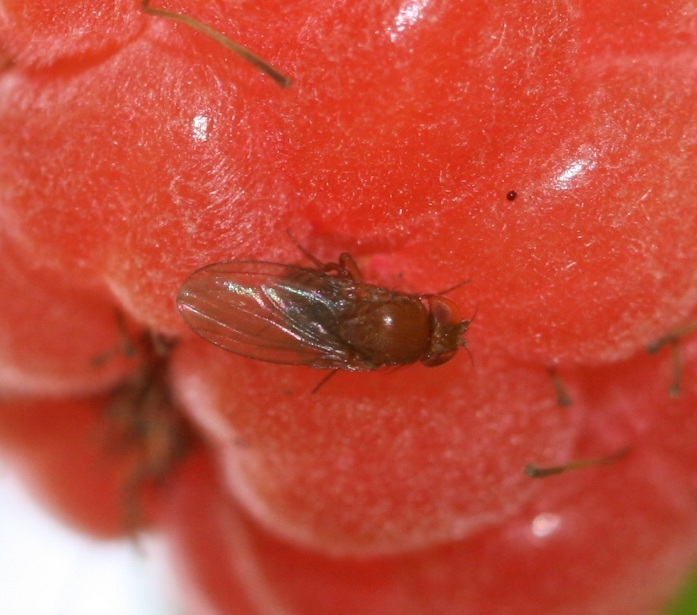 Last year D. suzukii (also called the spotted-wing drosophila or SRD) was detected in Florida where it became an issue in fruiting strawberry fields and on farms of the state’s fledgling blueberry industry. At the end of last month, Dr. Burrack found high numbers of SRD on strawberry, blackberry and raspberry fruit at The Upper Mountain Research Station of Ashe County in the northwest corner of NC. The damage to fruit was significant. However, the situation at the Sandhills Research Station in the eastern part of the state – about 60 miles west of Fayetteville – was less dire. The assumption is that SWD does not survive and reproduce well at high temperatures, which previous studies bear out. However, in all likelihood the SWD numbers will pickup with the cool temperatures of autumn and the maturation of fruit. Agricultural entomologists also predict that SWD will hit crops hard next summer. 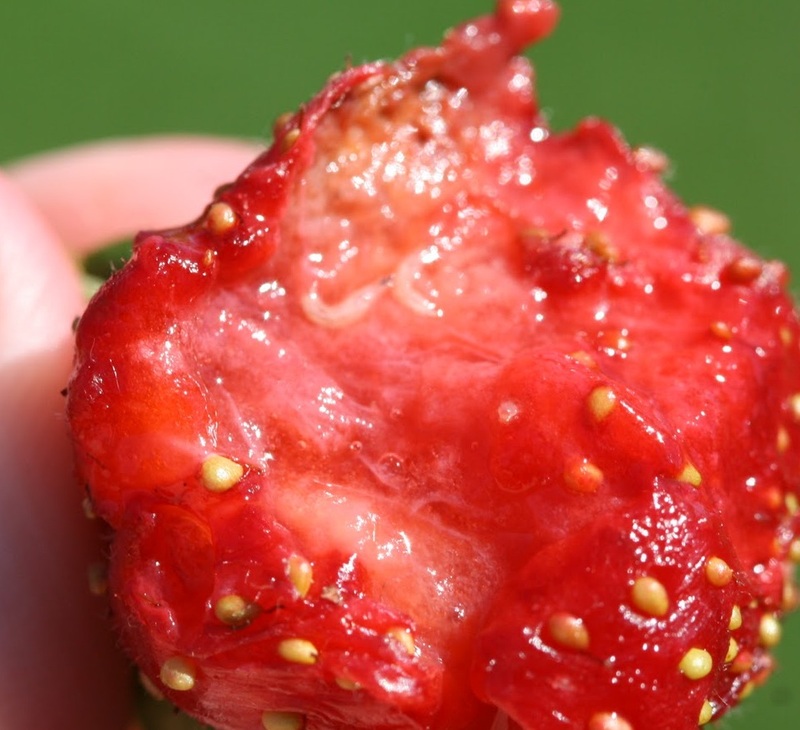 In California, Oregon and Washington the SWD has infested most soft fruit crops including cherries, apples, blueberries, grapes, nectarines, pears, plums, pluots, peaches, raspberries, and strawberries. In NC it’s expected to have an impact on those fruits that are grown here. Dr. Burrack offers some hope that sanitation of growing areas (i.e. cleaning up dropped fruit and disposing of infested fruit) will have a big impact on limiting this pest. Likewise, pesticides seem to be fairly effective in knocking down SWD numbers. Of course preventing invaders like SWD from moving to new locations in the first place is the best strategy. But in all honesty its difficult to do that without impinging on interstate and international commerce. More information can be found on Dr. Burrack’s blog. I'm a nature freak who loves getting out, down and dirty. My passion for nature has, somewhat unexpectedly, driven me to a professional career working with insects and people that love them. This entry was posted in Uncategorized and tagged Diptera, Dr. Hannah Burrack, Drosophila suzukii, fruit fly, insect, invasive, North Carolina, raspberries, strawberries, SWD. Bookmark the permalink.